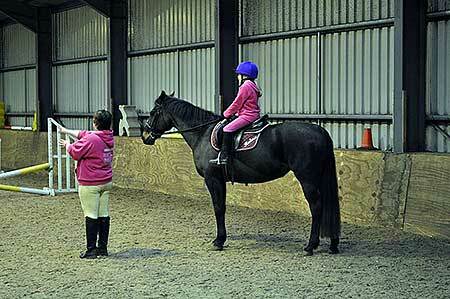 Don’t worry about the weather, most riding lessons are held in our superb Indoor Arena. Our experienced instructors will cater each lesson to your needs, and focus on helping you to improve your technique. If you have a specific aspect of riding that you would like to concentrate on, be it jumping or dressage, they’ll be more than happy to help you out. For beginners, we usually recommend a ½ hour private or semi-private (2 people) session, one-on-one with the instructor, just to get you going. Once you’ve picked up the basics, group lessons for up to six people are a great way to boost your confidence and meet like-minded people (and they help to look after the pennies too!). Groups of all abilities run most weeks, and if there isn’t one to suit, you can always start your own! Of course, private lessons are still an option if that’s more your style, or semi-privates for you and your best friend. Basically, it’s up to you! To make sure our horses don’t get over-worked, we’ve limited private lessons to half an hour. We’ve found in the past that a 1 hour private lesson can be too intensive for them, and we have to put them first. We’re sure you’ll understand. If you think a full hour in the school is going to be too much, then how about a “half and half”? This is a half hour lesson followed by a half hour hack, which gives you the chance to put what you’ve learned in to practice! Young children are welcome to come for private lessons at any time, but we’d highly recommend our Unicorns Groups as well.